Autumn is right around the corner, but preparations in Northwest China's Qinghai province to reap a bountiful harvest are already in full swing – but farmers there are doing much more than plowing the fields and planting crops. As of August, and for the next couple of months, visitors to the area of Sanchuan in Minhe county, the easternmost point of Qinghai, will be treated to a vibrant scene: colorful flags fluttering in the breeze, villagers wearing traditional Tu ethnic costumes, and song and dance performances staged in the open accompanied by the thundering sound of gongs and drums. The Nadun Festival, celebrated by the Tu ethnic minority group, falls between the 12th day of the seventh month and the 15th day of the ninth month on the Chinese lunar calendar (August 22 to October 23 on the Gregorian calendar this year). The annual festival is dubbed by many as "the world's longest carnival" as it spans two months. The origins of the Nadun celebrations are not documented, but an oft-told story reveals that the grand event is tightly linked to the agricultural work in ancient times. During the late Yuan Dynasty (1279-1368) and early Ming Dynasty (1368-1644), members of the Tu ethnic group began to settle in permanent communities to carry out farming work and breed animals, and eventually abandoned their primary nomadic lifestyle. A temple fair was originally organized to resolve conflicts resulting from agricultural competition between villages and boost cooperation and interpersonal relationships. It later evolved into its current carnival format among members of the Tu ethnic group, and was held by two villages together – one playing the host and the other the guest before making a switch. Today, various consecutive temple fairs are held from August to October at different villages in Minhe county, inviting the whole of Tu ethnic community and visitors to participate in the ceremonial festival to celebrate the harvest. The village-level harvest festival, inscribed on China's National List of Intangible Cultural Heritage in 2006, is not only the most important entertainment for Tu ethnic group but a perfect example reflecting their efforts to create and maintain a harmonious community. The Tu ethnic people, locally termed as the Monguor, mostly live in Northwest China's Qinghai and Gansu provinces. They have no written alphabet, and speak their own language, which is part of the Mongolic language family but one that is heavily influenced by local Chinese and Tibetan dialects. 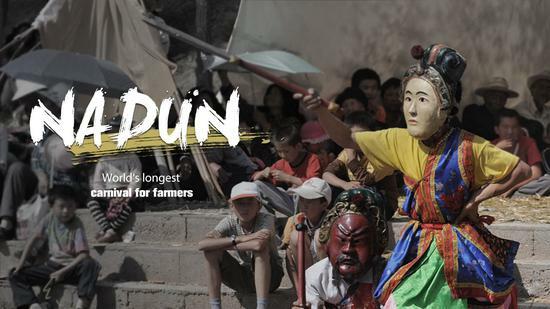 "Nadun" means "having fun" and "entertaining" in the Monguor language. The ceremonial festival, which bears resemblance to the Mongolian Naadam festival, embraces quite different celebrating formats and content. Though sharing the common origin of northern nomadic people, ethnic Mongolians make the Naadam a grand showcase of prowess and skills through the "Three Games of Men" to commemorate their warrior culture and nomadic lifestyle. Whereas ethnic Monguor, who barely lead nomadic lives but engage instead in farming nowadays, hold a series of temple fairs from one village to another, featuring mask dances and opera performances as well as sacrificial offerings to celebrate the profuse harvest and pray for good fortune. The Nadun Festival thus is also entitled "Farmers' Carnival" or "Harvest Celebrating Fair," and can be divided into three stages -preparation, small meeting and formal carnival. Preparations start as early as Tomb-Sweeping Day in April and see the residents of Sanchuan preparing sacrifices to God Erlang, who they believe once saved the world, and other gods in local temples. Leaders for the upcoming Nadun will then be elected, tasked with raising funds, and organizing and coordinating events and activities between villages. Tents are then erected before the festival to host small meetings, during which villagers offer sacrifices in front of deity statues that are moved from temples into the tents in advance. The organizers of the festival will beat gongs and drums on the last day to announce that the festivities will soon begin. The temple fairs feature diverse activities displaying the unique heritage, culture and folk arts of the Tu ethnic people, from music and dances to rituals and costumes. As traditional music plays, scores of villagers dance together, swaying their bodies, and moving from left to right in circles. The mask dance, also known as "Nuo dance," is another highlight that usually marks the conclusion of the carnival. Several classical mask dance dramas will be presented including "Crops Qi", "Five Generals" and "The General who Killed Tigers". Most of them tell stories about how the ancestors made a living through farming and animal husbandry to commemorate their tough fighting spirits and optimistic attitude towards life. Villagers dance and laugh merrily with the thundering music as an invitation to the gods to join them and enjoy the treats, which symbolize the connection between divine and human beings.